The MDT Ground Movement Monitor (GMM) connector kit lets you read your existing GMM’s from other manufacturers using our SMART Reader, or other data acquisition devices. The alligator clips are colour coded to connect to the wires from your GMM. Instead of reading a resistance, we pass a regulated voltage across the potentiometer in the GMM, which returns a value. The readings will vary from 000 (closed) to 500 (fully extended). To calculate your displacement, just multiply the reading by the potentiometer length and divide by 500. If you have Ground Movement Monitors (GMM’s) in your mine that were not made by MDT, they may have come with bare wires (usually green, red and black). If this is the case, MDT has a solution to simplify reading these older style instruments with our SMART Reader. 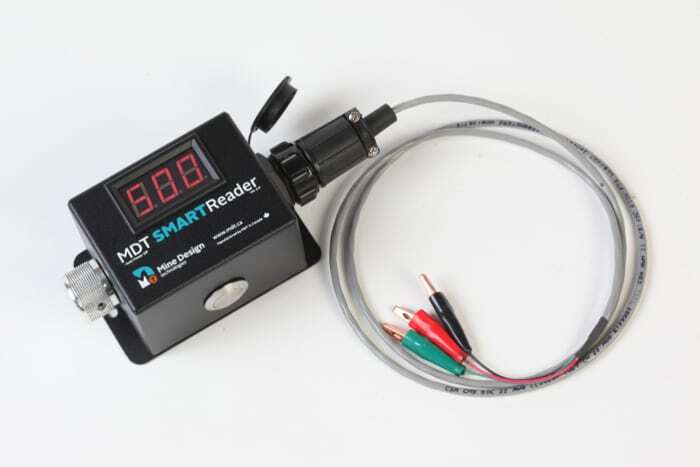 Simply connect the colour-coded alligator clips to the bare wires from the GMM and plug the connector into our readout box – no more fiddling with multimeters and resistance measurements! Ask MDT how this solution can work for you. Moving forward, you can purchase GMM’s directly from MDT with our standard connector, so it can easily be interfaced to the SMART Reader, SMARTLog or SMARTLog3, and the Wireless MDT-RTU. We can read up to 18 GMM’s on one SMARTLog3 or MDT-RTU! Comes standard with 1m of leadwire, longer lengths upon request. Contact MDT for instruction manual at support@mdt.ca.